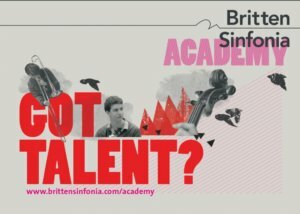 Please note that the deadline for applications to Britten Sinfonia Academy 2018-19 has now passed. We are recruiting talented, young instrumentalists from the east of England to develop their chamber music skills through a range of exciting ensemble projects. Participants receive expert mentoring from Britten Sinfonia musicians and work alongside key guest artists from our main season. In order to fully complete your application your instrumental teacher must submit a short paragraph for you. Your application is only complete once both of these forms have been received before the deadline on Monday 5 February 2018. Should you require a pdf version of the application form, please email [email protected] and we would be happy to supply accordingly. There are two rounds of auditions: individual auditions held in March, and a group audition held in July. Successful applicants will be invited to the first round of auditions. Auditions will take place in Cambridge on the following dates (more dates and locations may be added subject to demand). You will be allocated to attend one of these dates. Successful first round auditionees will be invited to attend a second round group audition on Sunday 15 July 2018, you must be available for this date. Any queries contact [email protected] or call 01223 341019.